This article is cross-posted from Central Seattle Greenways. On February 29, 2016, Central Seattle Greenways volunteers and Seattle Neighborhood Greenways staff met at Capitol Hill Station to conduct an accessibility audit of the station area. We focused on three priorities: safety of street crossings, obstructions in crosswalks and along sidewalks, and sidewalk capacity. The station is expected to serve 14,000 riders every day in 2030, making safety and accessibility of the entrances a significant priority. The map below shows the audit area. Intersections that were assessed are circled, and station entrances are marked with stars. Specifically, the intersections were: Broadway E & E John St / E Olive Way, Broadway E & E Denny Way, Broadway Ave E & E Thomas St, Harvard Ave E & E Olive Way, and 10th Ave E & E John St. 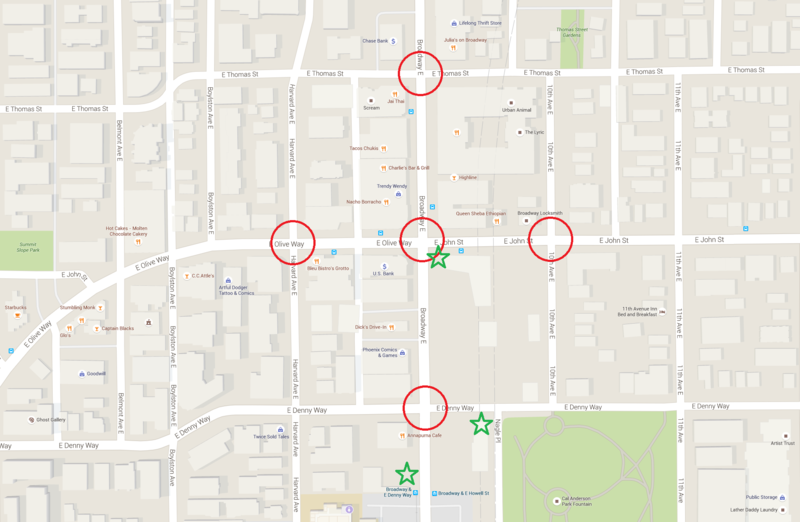 Assessed intersections are circled in red, station entrances are marked with green stars. Relocate or underground utility and signal control cabinets. Many of these are placed directly in the path of marked crosswalks, creating a barrier and reducing capacity. This is particularly apparent at the main station entrance on the southeast corner of Broadway E & E John St. Relocate utility and signal poles, many of which are blocking marked crosswalks. Some of the poles are partially blocking ADA ramps. Relocate fire hydrants that are blocking crosswalks and ADA ramps. These are particularly difficult for people with impaired vision to navigate around. Align ADA ramps on both sides of crosswalks so that people walking across the street can travel in a straight line without encountering an unexpected curb. Orient ADA ramps to be aligned with the crosswalk instead of at an angle. In particular, avoid using a single ramp that directs people walking into the middle of the intersection. The new ramp directly in front of the main station entrance at Broadway E & E John St is a particularly egregious example of what not to do. Rechannelize E John St / E Olive Way to add left turn lanes at Broadway E. The lack of turn lanes here causes drivers to change lanes unexpectedly as they approach and move through the intersection. Add left turn signal phases in all directions at Broadway E & E John St / E Olive Way. When the intersection is busy it’s common for drivers attempting to turn left to loiter in crosswalks or in the intersection waiting for a gap in oncoming traffic without watching for people crossing in the crosswalk. This leads to dangerous situations when drivers try to turn through an occupied crosswalk. Improve the crossings at Harvard & Olive Way and 10th & John with raised intersections, curb bulbs, or other traffic calming measures. Many drivers do not yield to people trying to walk across these intersections. I moved to the Summit neighborhood in 1984, when the work on Broadway – the tiled sidewalk, the dance steps, and the horizontal traffic lights – was finishing up. I was puzzled that Broadway & John didn’t have left turn arrows back then. I’m glad someone’s finally looking into how to improve this terrible intersection. So now bus shelters shouldn’t be allowed on sidewalks? I wondering about that one, too. There are probably ways to design bus shelters that are less of an obstruction to passers-by. For instance, remove side walls, move it more out of way, etc. In many street it may not be an issue at all. I think the post here is more like a call to think about the street design from pedestrian perspective. How much walkable width do we need at bus stops and how does it depend on traffic? Bus bulbs are an excellent solution to make room for bus shelters without obstructing sidewalk space. The way they incorporated the eastbound bus shelter onto the side of the light rail station at Broadway and John is a good example of unobstructive bus shelters. More of these or bus bulbs would be a big improvement! Bus shelters can be bus shelters without blocking the sidewalk. No need to plunk down a 3-sided hut right in the middle of foot traffic when a simple overhang will keep the rain off just as well. I would be all in favor of just outright banning A-signs and other forms of obnoxious advertising on sidewalks. We tried to make it work, but some businesses couldn’t play nice and ruined it for all. I’d be curious if it would stand up in court with businesses claiming freedom of speech (advertising slowly has become protected “speech” in our country). And sidewalk cafes are a conundrum. Some are done well, with plenty of sidewalk clearance and not in the path of flow. Others are so poorly located and clearly in violation of ADA and other sidewalk clearance laws that I have to wonder how much bribery money was kicked around to get them installed. Six Arms and Stateside on Pine and No Bones on 17th in Ballard are prime examples. As far as free speech is concerned, courts have been pretty consistent that you can generally regulate the time, manner and place of speech as long as you don’t regulate content. So, saying no signs on sidewalks is a clear example of regulating the place as long as what’s on the sign doesn’t matter. Seattle already has some pretty strict anti-advertising laws. Billboards are basically illegal except the handful that are grandfathered in. High rise buildings (except hotels) can’t even put names/logos on their facades. I was under the impression that Seattle was similarly stringent about sandwich boards. Maybe that’s changed? I don’t mind them usually but the ‘Now Renting’ signs everywhere are tacky. I’ve found that if you report illegal sandwich boards to the appropriate people, you’ll get a response. SDOT will only go to the specific spots you point out, but they will talk to the owners and usually the problem is gone within a week of reporting. Sometimes, the businesses play nice from then on out and sometimes they are back to violating within a week. From a pedestrian-safety aspect I am more concerned about more and more bicyclists riding very fast on the sidewalks, many acting like pedestrians are a nuisance.. I also wish there was some way to separate wheels from feet on the bridge approach to the UW Link station, many times recently have I come close to being run over even though I keep as to the far right as I can. Poor design pits peds and bikes all too often. The best recipe for getting people to stop biking on the sidewalk is to create safe, comfortable protected facilities for them to use. Ditto for getting people walking out of bike lanes (places like Dearborn have a bike lane with no sidewalk, so of course people walk in the bike lane). The UW Link bridge has a bike counter on one entrance but not the other immediately parallel entrance. I don’t understand why they didn’t attempt to separate modes, especially considering that’s exactly what they’re doing on The Burke. 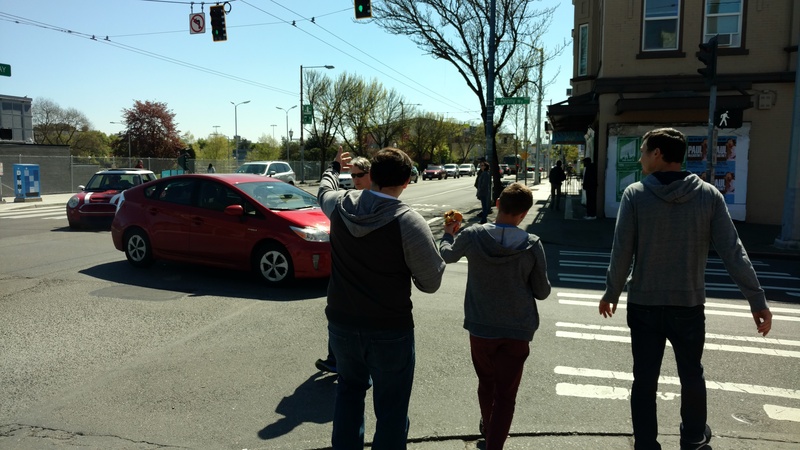 BTW, I put out a call for University Greenways to do a similar walking audit around the UW light rail station based on Central Greenways’ fantastic work. Be sure to keep an eye out for that if interested! Join the University Greenways mailing list (http://seattlegreenways.org/neighborhoods/university-district/) or watch their twitter feed (@UGreenways). I’ve had this problem in the U-District too. With the Burke closed, many cyclists have taken to using the sidewalk on the south side of Pacific, despite the fact that it’s narrow, rutted, filled with trees, and filled with pedestrians that are trying to get around all the construction as well (even with the Link station done, there’s no fewer than four construction projects that I can think of between 15th & Montlake along Pacific). I don’t know what can be done about the bridge over Montlake, but I think a lot of the problems further west will go away soon when the Burke finally, finally reopens. From street lights hidden in trees to sidewalks blocked by tree branches trimmed at only 6 feet above the concrete to new apartment building balconies where residents can reach out to touch power lines to this, the City needs to be better at incirporating things for pedestrians and urban density. It’s a much bigger issue than just this station area. The best way to fix this institutional unawareness is for complaints to get filed on a regular basis – with copies to the Dustrict council person – until enough of the staff realize that they need to pay attention better. It’s too bad we have to resort to public shaming on a blog. Lawsuits may be a solution in certain circumstances but I think more than that we need a general awareness of pedestrians needs and capabilities. For instance, the small sidewalk design details I discuss here http://otoomet.blogspot.com/2015/10/improving-pedestrian-experience-cheap.html . i suspect that the signal and channelization issues are left alone until the Roy Street streetcar project begins. We also need to get the mass of A-boards removed from the front of the Broadway Alley building (in front of Ha Na and Americana). They take up about 70% of the sidewalk width there with maybe a 2-3 ft clearance width between the Americana outdoor dining area and the street. I’ve actually had to stop and wait for oncoming foot traffic to pass at that spot. Doesn’t seem legal to block that much of the sidewalk. FYI, the City does have rules about A-boards, and they are occasionally enforced with fines. See this article about an argument over rules in West Seattle. It’s a mess, but here’s the sign code. It’s pretty clear from reading them that the writers gave zero consideration to sandwich boards or other types of “permanent temporary” signs. In 23.55.012, subsection C3 on “Temporary Signs on Public Property or in Planting Strips.”, it seems to indicate that for specifics we should refer to “City of Seattle Public Works Rules Chapter 4.60” which I flat out cannot find on the internet. A-boards are usually classified as “portable signs” and they are illegal according to the Municipal Code. 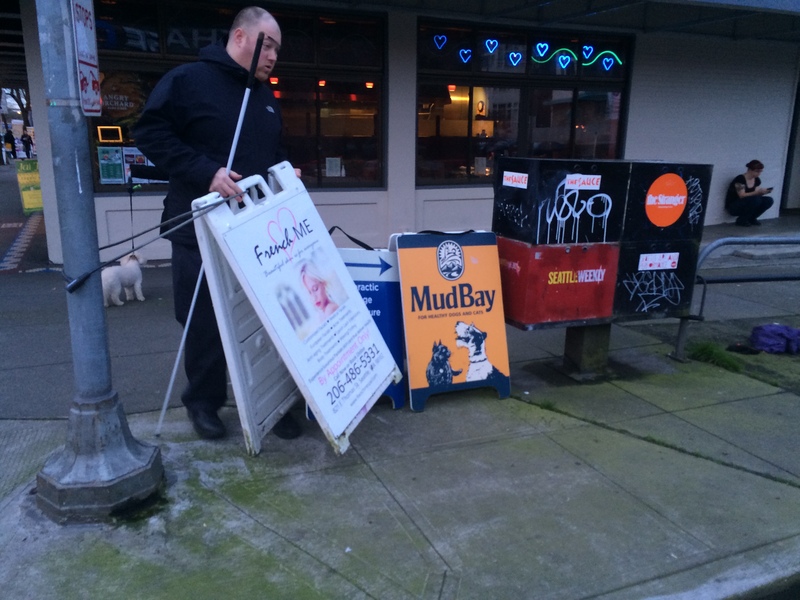 Reporting illegal A-boards to the City usually results in an informational letter being sent to the business. No sign shall obstruct or impair access to a public sidewalk, public or private street or driveway, traffic control sign, bus stop, fire hydrant, or any other type of street furniture, or otherwise create a hazard, including a tripping hazard. You could always step up and address the issue yourself, as an acquaintance of mine once did when a neighbor kept absent-mindedly leaving his trash in the street – it was one of those orange traffic cones, and the neighbor somehow kept dropping it near the curb in front of his house and forgetting to take care of it! Very unfortunate to inadvertently obstruct the roadway like that. My acquaintance did him the favor of dropping the unwanted, neglected traffic cone into the recycling bin, so that the public roadway in front of his neighbor’s house could once again be used for public parking as it was intended. Perhaps a similar effort would be in order, to helpfully clean up these obviously unwanted signs that have been inadvertently abandoned in the public walkway by their forgetful owners? We discovered during this process that many of the A-boards are locked to poles with bike chains, making it difficult for them to be cleaned up by thoughtful pedestrians. Even if the A-boards themselves are legal, which they often aren’t, is locking them to utility or sign poles legal? With regards to left turns, I experienced a scary moment a few weeks ago from a driver’s perspective. I was making a left from 35th Ave. in Fremont onto Stone Way and waiting for a large van to pass in the oncoming direction before making the turn. When the van passed and I started to turn, there were people in the crosswalk that appeared, seemingly out of nowhere, but my the time I saw them, it was too late to stop. Fortunately, I did not hit anyone, but it was still jarring enough that I drove 20 mph the rest of the way home. Thinking about what happened, I believe the problem was that the people crossing entered the intersection right at the time the van was blocking my view, so by the time the van had cleared the intersection, the people behind it were about 1/4 of the way across. Had the van been, say, an eighteen wheeler, the obstructed view problem would have been even worse. Protected left turns certainly solve this problem from a safety perspective, but they come at a price of making everybody wait a longer at red lights, including buses and pedestrians. I don’t like it, but maybe it’s the least bad solution. I don’t think banning left turns altogether at an intersection like Broadway and John work – it would simply result in drivers who want to turn left cutting through the neighborhoods instead. One of the basic problems is that SDOT doesn’t put signal heads on the poles on the side. Other cities do. That’s valuable because when there are delivery trucks or buses, no one behind them can see what color the signal is! There was a AAA study highlighted on 20/20 (I believe) several years ago that explained that this is the single more effective way to reduce accidents at the most dangerous urban intersections. 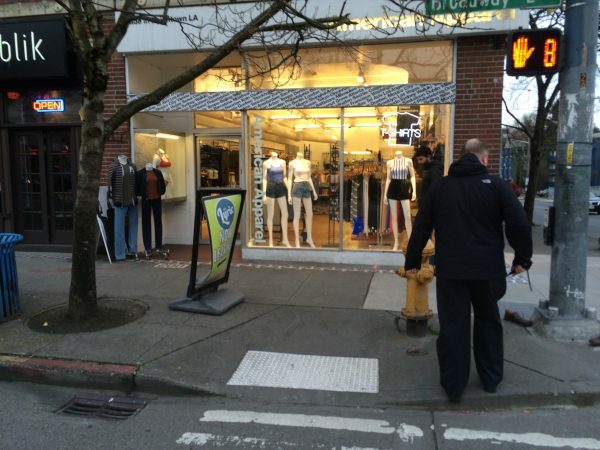 This problem exists at lots of places in Seattle, especially where the street is inclining upwards. Beacon and Columbian is the place where I cringe often because of not knowing what the signal light says.. I should make it clear that the side signal heads discussed here are in addition to the standard two above the intersection lanes — and not in place of. Isn’t the problem with beginning a left turn without having a clear view through the intersection? Sure it was clear before the truck went by, but is it clear now? Same thing if you can’t see the traffic signal, better pull up to the stop line and wait until you can see it. Part of the problem may be that in this rapidly urbanizing part of town, with hundreds and hundreds of units springing up, plus Brooks and all the trendy restaurants, what you might not have thought of as a prime walking district has become one. Stone Way is quite wide, but suddenly where there used to be only home improvement stores with their own parking, there are condos and apartments and brew pubs and other destinations and people walking to them. Sometimes those people are me, too. As Jonathan suggests, until you know, you shouldn’t assume that your obstructed view was not missing legally (or even illegally) crossing pedestrians. It seems to me like the answer is to ban left turns in some areas, and have left turn lights in others. It really depends on the neighborhood. If there is a good grid, and you really want to keep things moving on the main street, then banning left turns is the way to go. If there isn’t, then a left turn arrow is fine. In the case they suggested (northbound Broadway to westbound Denny Way) banning the left turn makes sense. Just about everyone in that situation will simply continue up to Olive. The handful that want to go to that little section of Denny between Broadway and Olive will loop around (take three rights). It will be slow, but the driver isn’t going very far anyway. In the other case — 35th and Stone — a left turn arrow makes a lot of sense. As mentioned, there is a lot more pedestrian and automobile traffic in the area. So while this probably would have been overkill 20 years ago, it makes sense now. In the grand scheme of things, a left turn arrow that detects traffic is fine. It only turns for a few seconds. Those going straight are held up a bit, but usually not that long. Pedestrians have to wait, but safety first, as they say. If there is a lot of oncoming traffic, then having the left turn signal is the only way for several cars to turn. That really isn’t the case with that intersection (yet) but it may become that way fairly soon. Unfortunately, the city doesn’t have unlimited money, so until then, people have to be careful. Personally, left turns freak me out. UPS, I believe, bans them. I see people take them way too fast. Taking the turn at about bicycle, if not pedestrian speed is the way to go. That might mean you have to wait a while, but taking a left turn without an arrow should be a very rare occurrence. 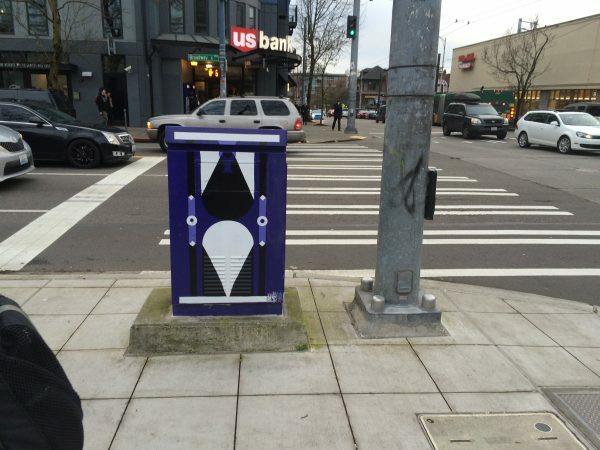 I consider myself to be something of an expert on Capitol Hill sidewalks, and in my opinion, the sidewalks are wide enough to allow room for both bus shelters, trees, signs and newspaper boxes, and a walking path. If freeways can have different sections … shoulders, hov lanes, and general purpose lanes, why can’t sidewalks be divided into different purposed lanes? Great idea. We can then hire thousands of ‘Sidewalk Lane Enforcement Officers’ (SLEOs) to ticket anyone who isn’t using the sidewalk properly. Sam – you are 100% correct! We need stroller lanes, LOL’s (Link Only Lanes) for people walking to the Link Station, dedicated lanes for groups of 2 or more, middle lanes would be express lanes for the Capitol Hillers going more than 3 blocks. Just need to clear the path on all the sidewalks and paint the lanes in. Shall we contact Mr. Kubly? The problem with eliminating left turns from NB Broadway to WB Olive Way, is that there are currently no left turns permitted at Denny or Pine. 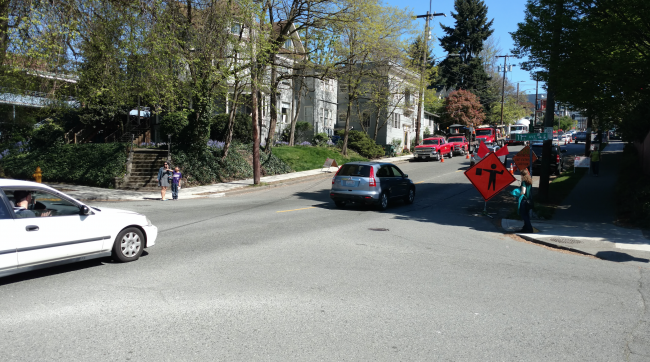 Pike St is the last intersection that a legal left turn can be made and that’s just shy of half a mile away. If you prevent turns at Olive, people will start turning left down Thomas, which is a residential street. The next arterial is Roy, and from here there isn’t any meaningful way to get back to Denny which is where the majority of cars turning left at Olive are headed to. If the concern is pedestrian safety, then add a turn cycle to Broadway, but don’t force those cars onto a residential street or pedestrian safety will suffer even more. 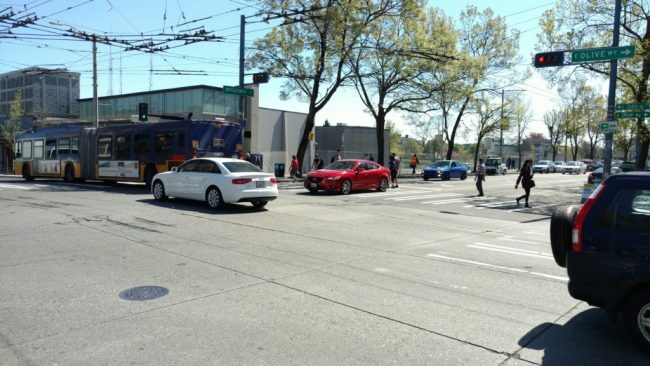 Oops, just re-read, and it’s Denny Way you want to prevent left turns onto, not Olive. 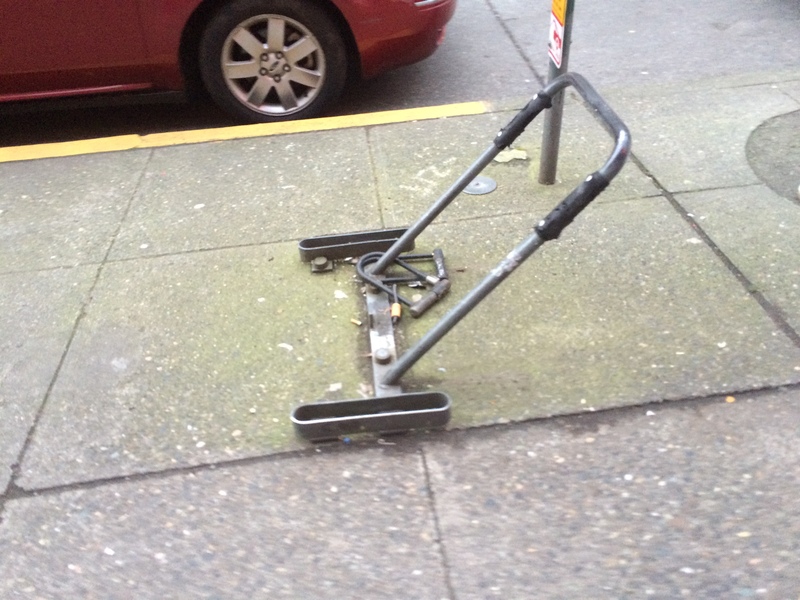 That old bike rack is absurd, and so is the forrest of a frame signs out in front of the Broadway Alley. Build a bonfire. Those signs are an eyesore and make that stretch of sidewalk impossible. I live one block from here – this is a fantastic characterization to what, for me, makes walking here miserable rather than enjoyable.